At the end of the previous book we saw Phoebe and her friends travelling to Asgard so she can stand trial for helping Baldur escape. The Goddess Frigg blames her for Baldur's death but Phoebe is hoping she'll be given the chance to prove her innocence and make sure the real culprit is punished. Frigg isn't willing to listen to reason though, her son is dead and all she cares about is getting revenge so it looks like Phoebe will receive the ultimate punishment and find herself exiled to Helheim, the real question is whether Fen will be sent with her or if she'll have to face a new realm full of enemies completely alone. This series really is going from strength to strength. 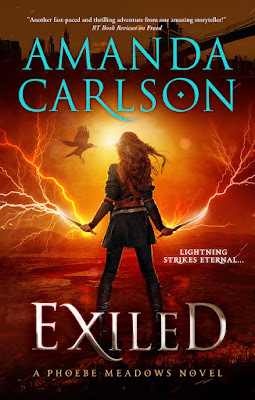 I love the Norse mythology Amanda Carlson has taken inspiration from and I really enjoyed getting the chance to spend time in both Asgard and Helheim in this book. It's great that we get to explore new places in every instalment of this series and the author does a brilliant job of making each realm feel completely different to the ones we've already visited. The story is action packed as Phoebe is set an almost impossible task by Frigg and she has to face her scariest enemies yet if she wants to be able to return from her exile in Helheim. Phoebe gets the chance to meet more of her family here too which was a lot of fun, not only do we catch up with her adoptive parents in the human realm but we also learn more about the Valkyrie side of her family and she finally gets to meet her father Odin. The romance between her and Fen is still going strong and I continue to love the friendship between Phoebe and her human friend Sam too. Odin and Frigg aren't the only gods in the mix and Loki is causing mischief just like you'd expect but luckily Phoebe has some powerful allies as well as enemies or she'd be in even more trouble. I've been having so much fun reading this series and I'm eagerly awaiting the next instalment to see what adventures Phoebe gets up to next.